The ezCAN accessory manager for select BMW motorcycles lets you easily add and configure accessories without cutting any wires. Letting you add a host of additional visibility and safety features to your motorcycle. This is the HEX ezCAN Accessory Manager for the BMW F800. Our ezCAN is an accessory manager for motorbikes which enables you to seamlessly add various aftermarket accessories (such as additional lights, air horns, GPS's, heated jackets, phone chargers...) with ease and without cutting any wires or voiding your warranty. Customise your bike and make it safer to ride. This is the HEX ezCAN Accessory Manager for the R1200. Our ezCAN is an accessory manager for motorbikes which enables you to seamlessly add various aftermarket accessories (such as additional lights, air horns, GPS's, heated jackets, phone chargers...) with ease and without cutting any wires or voiding your warranty. Customise your bike and make it safer to ride. This is the HEX ezCAN Accessory Manager for the R1200 LC (Liquid Cooled range). Our ezCAN is an accessory manager for motorbikes which enables you to seamlessly add various aftermarket accessories (such as additional lights, air horns, GPS's, heated jackets, phone chargers...) with ease and without cutting any wires or voiding your warranty. Customise your bike and make it safer to ride. This is the HEX ezCAN Accessory Manager for the K1600. Our ezCAN is an accessory manager for motorbikes which enables you to seamlessly add various aftermarket accessories (such as additional lights, air horns, GPS's, heated jackets, phone chargers...) with ease and without cutting any wires or voiding your warranty. Customise your bike and make it safer to ride. The power to manage your accessories safely. Find useful guides and support information for the HEX eZCAN devices on our technical support site. Download the latest version of our HEX ezCAN configuration software for Windows PC. Download the latest version of our HEX ezCAN configuration software for Mac. Installing and managing the HEX ezCAN is easy, simply select your model of motorcycle and follow the steps or watch the video and see for yourself. Download the latest version of our HEX ezCAN configuration software for Mac . Models: R1200, R1200 LC, K1600 or F800. 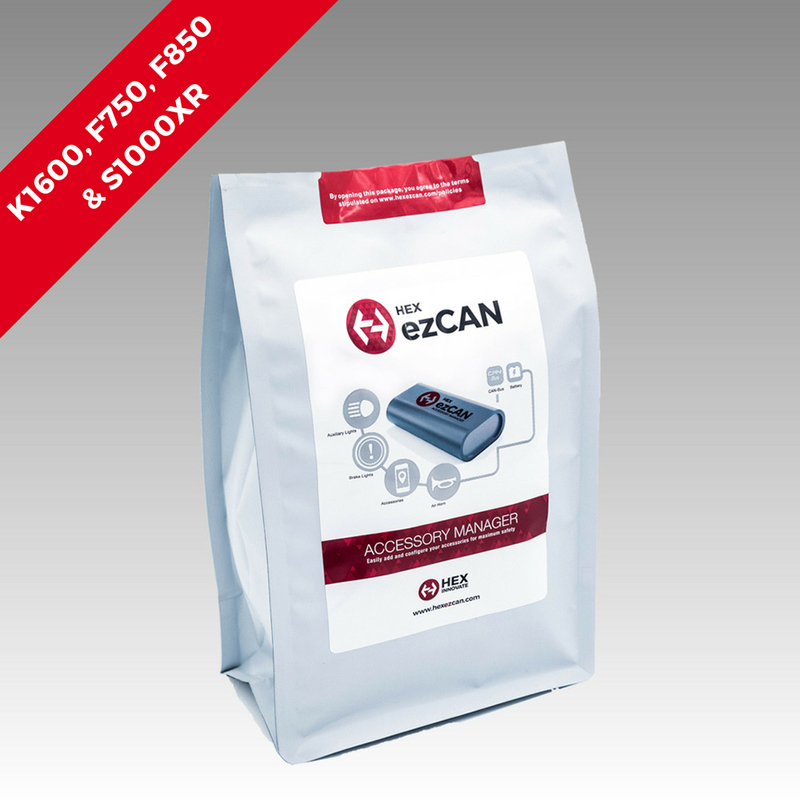 Our installation support for HEX ezCAN is hosted on our microbrand technical support site. By clicking accept and continue below you will be redirected to this site. Our software for HEX ezCAN is hosted on our microbrand technical support site. By clicking accept and continue below you will be redirected to this site.